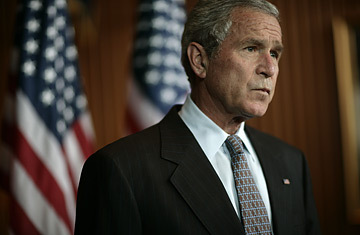 President George W. Bush speaks to reporters. Strip away the varnish that President Bush will apply when he addresses the nation Thursday night, and the truth about Iraq is grim. Four and a half years after the launch of Operation Iraqi Freedom, a war that has cost America thousands of lives and hundreds of billions of dollars is nowhere near a satisfactory conclusion. The good news, as presented by military commander General David Petraeus, is that the situation is not deteriorating as rapidly as it was a year ago. The level of violence in Iraq, he appeared to be arguing  although his metrics were widely contested  has been reduced to those of the summer of 2006. Should such progress continue, it will be possible, he said, to reduce the U.S. troop commitment in Iraq by the summer of 2008 to the force levels of the summer of 2006. "Accepting" this suggestion will be the headline centerpiece of President Bush's speech as he looks to reassure a nation that a light shines at the end of the tunnel. But it has been widely known by everyone in Washington  and, no doubt, by the field commanders of the various enemy formations America confronts in Iraq, who also watch CNN  that the U.S. could simply not sustain the troop levels of the surge much beyond next spring without seriously damaging its military. The drawdown, in other words, is not necessarily a sign of progress; it was inevitable given the current size of America's military. More worrying, perhaps, is the fact that the levels of violence that prevailed in Iraq in the summer of 2006, even if they later became worse, were already horrific. In the best-case scenario, the surge has managed to tamp down the spike in violence that has occurred over the past year, but the surge itself is finite. So, it is hard to avoid the impression that the U.S. is essentially treading water in Iraq. And the various insurgencies and militias it confronts have the advantage of being the home team, which allows for patience greater than that of a military deployed thousands of miles away from home. The surge was conceived of as a drive to take control of the streets, particularly Baghdad, in order to allow Iraq's elected politicians a safer environment in which to forge the vital compromises on issues ranging from reintegrating members of Saddam Hussein's Ba'ath Party into government and security structures to the sharing of oil revenues  in short, to negotiate their way to a stable power-sharing arrangement. That, quite simply, has not happened, nor is there any sign that it's likely to. The reason the politicians have failed to agree is not the violence on the streets; the violence itself is in most instances a symptom of the power struggles between Shi'ite, Sunni and Kurdish factions, as well as, in some cases, the internecine struggles for political dominance within those communities. The power struggle among Iraqis is nowhere near over. So limited has progress been on the political front that the prime achievement the Bush Administration has been touting is the alliance the U.S. has struck up with Sunni tribal sheikhs in Anbar province against al-Qaeda. This is certainly an important tactical advance in confronting the jihadists in Iraq  although it's not entirely clear whether the greater shift has come from the sheikhs (long a backbone of both the Saddam regime and then of the insurgency), or from the U.S. in finally recognizing that the Ba'athists were open to cooperation against al-Qaeda. Although the fighters represented by the Anbar sheikhs made common cause with the jihadists for a time against the invader, the sheikhs have recognized that the Qaeda forces in their midst are doing them more harm than good. But the groups with which the U.S. is cooperating in Anbar are not only outside of the Iraqi government; they are actively opposed to it, seeing it as a Shi'ite entity beholden to Iran. Such cooperation helps deal with the problem of al-Qaeda in Iraq  a brutal presence, to be sure, but still a minority element in the overall Sunni insurgency  but it doesn't necessarily reinforce national reconciliation. If the U.S. is forced to make such local-level arrangements to deal with local-level problems, that's because the central government is an ineffective vehicle for the U.S. agenda, or, indeed, for any sort of governance right now. Having conceded to the principle of Iraqi sovereignty, however, Washington is in no position to change Iraq's government. The testimony this week from Ambassador Ryan Crocker and General David Petraeus on Capitol Hill appeared to offer a reality check to a legislature whose debate on Iraq often appears disconnected from reality. The "benchmarks" set by Congress to measure Iraqi progress and justify the U.S. deployment were criticized by Ambassador Crocker as unrealistic. Indeed, they are U.S.-designed goals that Washington has spent years cajoling Iraqi politicians to pursue. But aside from promises, there's been scant evidence of any genuine Iraqi intent to implement them. The Iraqi leaders are unlikely to believe that the U.S. will make its decisions on how long to remain in Iraq based on their performance. They know that political and military realities will eventually force the U.S. to leave, and some of the key Iraqi players are using that as an opportunity to best position themselves for the power struggles ahead. Moqtada Sadr is a prime example: His tactical shifts between standing down his forces and alternately confronting the Americans, the Sunnis and his Shi'ite rivals suggest a strategy of boosting his position while husbanding his political and military resources for a post-U.S. power struggle. While the Democrats will demand an accelerated troop reduction, that position may be more politically convenient than practical. By invading Iraq, the U.S. irreversibly altered the balance of power throughout the Middle East; now, Iraq cannot be treated as a policy decision in isolation from the full spectrum of U.S. interests throughout the region  all of which will be calamitously weakened if the U.S. were to precipitously retreat. While the congressional discussion focused on the failure to achieve consensus among Iraq politicians, it may be that the absence of a consensus on Iraq between the U.S. and Iraq's neighbors is even more dangerous. Given the weakness of the central government in Iraq, stability there is unlikely without an agreement among Saudi Arabia, Syria, Turkey and Iran over managing the political contest there. The most powerful stakeholder among them is Iran, which has close ties to the dominant political parties returned by the Iraqi electorate. And as long as Iran believes the U.S. is pursuing a policy of regime-change in Tehran, it has little incentive to help out Washington. Almost five years into the Iraq war, there's every reason to expect that the grim Iraq scenarios presented this week by General Petraeus and Ambassador Crocker will be largely similar to those that will be on the desk of the incoming U.S. President in January 2009. From what we were told this week, it appears likely that the next Administration will inherit an Iraq with nearly as many troops as were there in the summer of 2006. President Bush will console himself that at least he avoided the spectacle of an ignominious U.S. retreat from Iraq on his watch. But his successor will be handed a poisoned chalice.